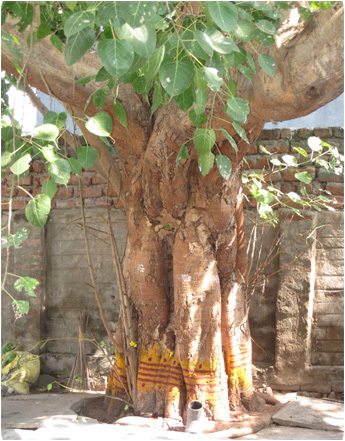 The fabrics used to create CHAKRA garments and home goods are printed using the exquisite ancient Indian technique known as kalamkari. This complex and laborious process of fabric decorating has been passed down from generation to generation among Indian families for centuries. The exact origins of the technique are unknown, however ancient texts indicate that the craft was widely practiced in southern India, and particularly in Andhra Pradesh, at least as early as the 13th century CE. Merchants across the globe used Indian kalamkari textiles as currency in the Spice Trade, and eventually these fabrics became luxury items in Europe, Asia, and the Middle East. By the mid 20th century, however, demand for kalamkari textiles had fallen off almost entirely. In 1957, art activist Kamaladevi Chattopadyaya pushed to establish a government-run center to train young artists in the ancient practice of kalamkari. Today, the technique is experiencing something of a resurgence in popularity, and hundreds of people in the Andhra Pradesh area are now involved in kalamkari work. There are two distinct styles of kalamkari printing, associated with the two towns where the practice is centered: Sri Kalahasti and Masulipatnam. CHAKRA fabrics are printed in the Masulipatnam style, which involves hand block printing the fabrics as opposed to painting the designs with a brush. The process of kalamkari printing involves the use of natural dyes – coloring matter derived from leaves, stems, flowers, bark, minerals, and naturally occurring metals – and mordants, which help fix the color onto the fabric. The most common mordants used in this process are alum and iron acetate. 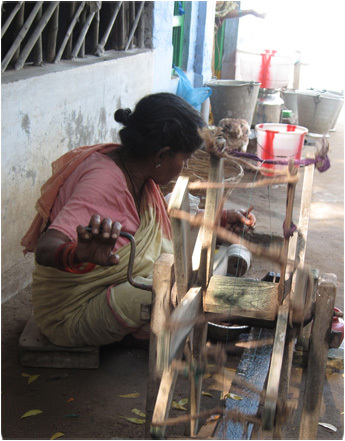 After being printed with the natural dyes, the fabric is boiled with a mordant. Most of the fabric colors are achieved during the boiling process. The depth and intensity of color vary according to the mordant and the dyestuff.